Winter is in full swing with the white ground and freezing temperatures as I look out towards the cattle barn from my warm living room. During this time it is important to consider your winter beef cow ration fed to your dry cows so they are in top body condition and health at calving time. Calving is just a couple months away or less depending on when your operation starts spring calving. To have the most optimal and cost effective ration it is crucial to test your forages so you know what nutrient values you have to work with and if feed supplements are necessary. Work with your nutritionist for ration balancing. 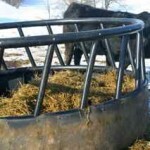 With hay prices higher this season and other feedstuffs cheaper, this may be the year to consider substituting corn or other co-products to your winter cow ration, especially if you are short on hay. If you’re thinking of substituting corn into the diet a rule of thumb is to feed the cow at least one pound of hay per 100 pounds of body weight. For the remainder of hay use the 1 pound of corn to 2 pounds of hay substitution guideline. Cows will act less hungry if they get fed 10-15 pounds of hay compared to reducing it more. To help determine if this is could be a cost saving measure one can utilize the “Hay-Corn Substitution Calculator” for beef winter cow rations found on the UW-Extension WI Beef Information Center website under the Decision Tools and Software tab https://fyi.extension.wisc.edu/wbic/decision-tools-and-software/.There are other tools for evaluating feeds and rations on this tab as well. Remember, the output is only as good as the information entered and cow response to intake and feed can vary. Article written by: Ashley Olson, UW Extension Agriculture Educator, Vernon County and recently appeared in Wisconsin Agriculturist Magazine.